Hello everybody. Welcome to my new project – a photo a day! This is my new adventure to try make sure I see the beauty in everyday and I will be sharing each photo with you. Please make sure you come check and look at all the photos and feel free to comment and tell your friends. The first photo is a double one. 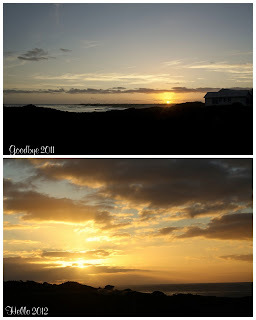 Saying goodbye to 2011 with the last sunset of the year and saying hello to 2012 with the first sunrise. Hubby and I woke up early this morning and watched the sunrise over Bettys Bay (where we are on holiday) – If the beauty of this sunrise is anything to go by this year is going to be BEAUTIFUL!